We’d love your help. Let us know what’s wrong with this preview of Aspettando Bojangles by Olivier Bourdeaut. Renée, Joséphine, Marylou, o anche, ogni 15 febbraio, Georgette, ama ballare con suo marito sempre e ovunque, di giorno e di notte, da soli e in compagnia degli amici, al suono soprattutto di Mister Bojangles di Nina Simone, una canzone gaia e triste allo stesso tempo. Per il resto del tempo si entusiasma e si estasia per ogni cosa, trovando incredibilmente divertente l’andare avanti del mondo. E non tratta il suo piccolo né da adulto né da bambino, ma come un personaggio da romanzo. Un romanzo che lei ama molto e nel quale s’immerge in ogni momento. La realtà, però, è a volte molto banale e triste, così scioccamente triste che occorre più di una prodigiosa arte del mentire per continuare a gioire del mondo. 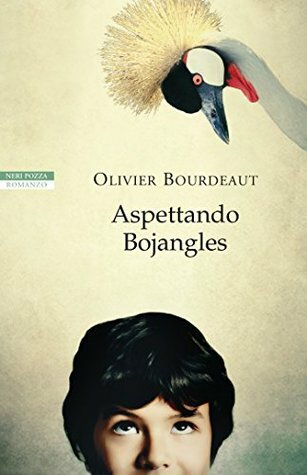 Romanzo-rivelazione della recente stagione letteraria francese, accolto da uno strepitoso successo di pubblico e di critica in Francia, Aspettando Bojangles ha segnato il sontuoso esordio di Olivier Bourdeaut, uno scrittore «dalla disperata levità di un Fitzgerald» (Les Inrockuptibles). «Una bella storia d’amour fou». «Olivier Bourdeaut fa il suo esordio in letteratura con una storia semplice, bella e folle». To ask other readers questions about Aspettando Bojangles, please sign up. Eccentric is a word describing this family from the book blurb, but that is to say the least - that is not the half of it. It’s fun and funny, actually zany, sweet and endearing, something different and it’s really very sad. Yet, this is a story filled with so much love and that is overwhelmingly the biggest takeaway for me. The unconditional love these characters have for each other is the very heart of this story . A young boy, whose name we never know, relates his wacky life with his mother and father, a man who calls his wife a different name every day as they dance to Nina Simone singing Mr. Bojangles while they drink and then dance some more. His narrative alternates with excerpts from his father’s journal. It’s a charming life in so many ways, but a reckless way in which to raise a child and that may get to you as it did me. However, I fell in love with this family and the joy in their lives in spite of the thing that was lurking, the reality of mental illness. It’s a short book, so I’ll skip telling anything of the plot. There is something beautiful about this story and it’s not surprising that it has won several French literary awards. In an interview in the Wall Street Journal 5/9/16, Olivier Boudreaut says that wrote “Waiting for Bojangles” “because I was going through a gloomy time myself,” he says. “I thought that if people would be kind enough to read a novel I’d written then it would be good to offer them a change of atmosphere by creating a world that is a bit off-the-wall and resolutely optimistic in spite of everything that happens.” He does just that. Poetry is a fascinating language. Iamb, iambic, trochee, ionic, pyrrhic, spondee, masculine rhymes, feminine rhymes, irregular rhymes; there are beats and measures and rhythms to poetry. This book is and is not poetry; it does and does not have specific measures or rhythms throughout. It most definitely does have a very poignant story – a tale of a family who experiences great joys, and down times that are difficult and trying for everyone. This book is also not a comedy, although it is so funny Poetry is a fascinating language. Iamb, iambic, trochee, ionic, pyrrhic, spondee, masculine rhymes, feminine rhymes, irregular rhymes; there are beats and measures and rhythms to poetry. This book is and is not poetry; it does and does not have specific measures or rhythms throughout. It most definitely does have a very poignant story – a tale of a family who experiences great joys, and down times that are difficult and trying for everyone. This book is also not a comedy, although it is so funny in places I couldn’t help but laugh. It most definitely is not a romance, although love runs like a river through it all. The family’s conversations are peppered with rhymes and various meters, as is the writing in this novel, in general. Most of it is written from the young boy’s point of view, although there are also excerpts from his father’s notebooks, too. She also taught him to be gallant – in her mind, being chivalrous was never frivolous. There was no room for us between her and her problems, there wasn’t even any air; they took up all the space that was there. The narrative poem style of this novel was entertaining by itself, although at times I admit that for me, it had to be inhaled slowly, like a meditation. Of course, the humour made it a strange meditation – that, and the fact that it looks just like any other books - it just doesn’t read like them. I loved the uniqueness of this novel as well as the blend of humour and pathos liberally sprinkled with fascinating bits of values and beliefs on the part of the characters. I grew to care for them – and although I haven’t yet mentioned Mr. Bojangles, reading this sent me to YouTube to find the rendition mentioned in this novel. I had never heard this version before, and I loved it. Mr. Bojangles was a song that was in my own repertoire and it never failed to move me while performing it or any other time I heard it. The version that was played so many times in this novel had the same rhythm and timing as the one I used to do – and it is different from the way many other performers play and sing it. Jaline Felicia wrote: "Really wonderful review, Jaline 💖"
Original and inventive. A Dr. Seuss kind of book but for adults dealing with a heartbreaking mental illness. The young boy in this book remains unnamed, his mother has different names bestowed on her by the father. A quirky, madcap life, totally without structure as the family tries to come to terms with the mothers manic moods in a totally unique way. The family live a free flowing life, one that flows and totally embraces the mothers moods. They even have a crane as a pet that is named Madam S Original and inventive. A Dr. Seuss kind of book but for adults dealing with a heartbreaking mental illness. The young boy in this book remains unnamed, his mother has different names bestowed on her by the father. A quirky, madcap life, totally without structure as the family tries to come to terms with the mothers manic moods in a totally unique way. The family live a free flowing life, one that flows and totally embraces the mothers moods. They even have a crane as a pet that is named Madam Superfluous. How clever is that? I in no way embrace the things this young boy is allowed to do but do understand the heartbreak of living with someone who has a mental illness. There is so much love in this book, that is apparent and wonderful to behold. I've never read anything quite like this, but applaud the author for her different take on loving someone with a mental illness. Love so strong that one enters the illness itself. Unrealistic possibly, but stirring to read. What a wonderfully crazy and delightful family that is encountered here, a couple and their young son. A couple madly in love, with a touch of crazy..a real mess unfolds in a most charming yet sad way, as mental illness takes over. I really enjoyed this story! I think you will too! Thank you to Netgalley and Simon & Schuster for the ARC! En attendant Bojangles est une belle claque à tous les niveaux. J'ai tout simplement dévoré ce roman en une journée ; tellement addictif. D'une légèreté incroyable avec une plume fluide mais surtout magnifique. Je suis trop fan. En attendant Bojangles, c'est l'histoire d'une famille hors du commun dont le couple, fou amoureux l'un de l'autre ne peut s’empêcher de danser encore et encore sur la musique de Nina Simone, Mister Bojangles, sous le regard émerveillé de leur petit garçon. Ils sont fougue En attendant Bojangles est une belle claque à tous les niveaux. En attendant Bojangles, c'est l'histoire d'une famille hors du commun dont le couple, fou amoureux l'un de l'autre ne peut s’empêcher de danser encore et encore sur la musique de Nina Simone, Mister Bojangles, sous le regard émerveillé de leur petit garçon. Ils sont fougueux, délurés, complètement extravagants, frôlant la folie douce et vivent dans leur bulle oubliant les tracas de la vie. Toujours du monde à la maison, alors on fait la fête sans oublier l'alcool pour plus d'ambiance. L'enfant nous raconte tout ça avec cette façon bien à lui de s'exprimer à cet âge là. Tellement fier de ses parents. Tellement belle sa maman même si parfois elle fait des choses bizarres. Tellement taquin et amoureux son papa, qu'il cède à tous les caprices de sa maman. On rigole aux phrases des protagonistes et puis, plus on avance, plus le cœur se compresse. Et pourtant ce livre fait du bien et en même temps fait de la peine. Alors l'auteur fait parler le mari, cet homme prêt à tout pour sa femme. Cette femme, cette maman si différente des autres. Fantasque. Dans son monde où personne ne peut y rentrer pour quelques minutes, quelques heures, parfois un peu plus. Même ses deux amours n'ont pas la clef. On ressent ce désespoir, cet amour, cette passion, cette folie à travers toutes ces lignes. Fascinant, captivant, hallucinant, euphorique, amusant... voilà ce que je viens de ressentir dans ce roman que je vous recommande vivement ! Ne passez pas à côté de cette merveille. Très, très belle découverte ! It took me just a bit to warm up to the author’s style of telling this short little story written in language right out of Dr. Seuss that Fred Rogers would appreciate. But I came to appreciate it. It is not easy to write or read about mental illness and loving someone through it, but Olivier Bourdeaut has done just that in a “happy and sad at the same time” manner that ultimately stirred my heart and tear ducts. Wat een ontzettend lieflijk boekje! Ik kan er geen betere omschrijving voor bedenken. Je wordt er droevig van en tegelijk ook blij. Een boek over een bijzondere vader en moeder en hun zoon, afwisselend verteld vanuit het perspectief van de zoon en de vader. De vader verzint de prachtigste leugens uit liefde voor zijn vrouw, die op een verrukkelijke manier lak heeft aan alle conventies. Moeder is namelijk op een hele prettige manier behoorlijk gestoord. Elke dag is het feest, men danst de hele na Wat een ontzettend lieflijk boekje! Ik kan er geen betere omschrijving voor bedenken. Je wordt er droevig van en tegelijk ook blij. Een boek over een bijzondere vader en moeder en hun zoon, afwisselend verteld vanuit het perspectief van de zoon en de vader. De vader verzint de prachtigste leugens uit liefde voor zijn vrouw, die op een verrukkelijke manier lak heeft aan alle conventies. Moeder is namelijk op een hele prettige manier behoorlijk gestoord. Elke dag is het feest, men danst de hele nacht door met zijn tweeën, met hun zoon, en meestal met de hele straat, het huis is altijd vol met gasten en het is een leuke bijzonderheid dat dit altijd gebeurt onder het toeziend oog van de struisvogel die zij eens van een reis naar Afrika hebben meegebracht. Omdat het elke dag feest is, verkoopt vader zijn zakelijk imperium, want hij heeft geen tijd meer om te werken en de jongen gaat daarom ook niet meer naar school. Dit leven geeft alleen maar plezier voor iedereen. Het is een sprookje! Zo mooi hoe de vader, die ook behoorlijk excentrieke trekjes vertoont, de moeder elke dag weer een nieuwe naam geeft. Hoe zou dat voelen, elke dag een nieuwe naam! Ik zou er geen bezwaar tegen hebben! Goede morgen Hortense, goede morgen Marie-Claire! Het is ontroerend te lezen hoe de vader en moeder elke dag diverse malen dansen op Waiting for Bojangles van Nina Simone. Deze plaat mag alleen maar op een bepaalde pick-up met de diamanten naald gedraaid worden. Andere platen zijn niet toegestaan op deze pick-up. Dat is elke keer weer een plechtig en prachtig ritueel. Het is heel knap hoe Olivier Bourdeaut die prettige, luchtige toon kan aanhouden tot het einde. Je houdt je hart namelijk vast voor deze lieve mensen. Je wilt dat hun fantasievolle leven eeuwig gaat voortduren, maar je weet dat de realiteit niet met zich laat spotten en hen uiteindelijk bij de kladden zal grijpen. Alocada, rara, extravagante, irónica, original, tierna, deliciosa...diferente. El principio es tan desconcertante como precioso y emotivo es el final. Me encantó. Alocada, rara, extravagante, irónica, original, tierna, deliciosa...diferente. The good surprise of french novel in 2016. And a first book. A crazy mother, but it is a soft, creative madness. The father in totally love for this strange woman and a son spectator, happy of the happiness of his parents but excluded from this fusional couple. Soundtrack ; Nina Simone, especially Bojangles. This choice is not innocent. Nina Simone was more than a singer, it was a tragic actress. I recently saw the film on the 50 year old on Montreux festival. Her interpretation of " Feeling" is i The good surprise of french novel in 2016. And a first book. Soundtrack ; Nina Simone, especially Bojangles. This choice is not innocent. Nina Simone was more than a singer, it was a tragic actress. I recently saw the film on the 50 year old on Montreux festival. Her interpretation of " Feeling" is incredible. It is on youtube. In spite of, the humour and the imagination of the beginning, we know that the drama will be there. Quand c'est le narrateur qui écrit, c'est du Petit Nicolas. Quand c'est son père (extraits de son roman), c'est vianesque par certains côtés. Et j'ai même trouvé quelques passages qui permettraient de le relier à Jasper Fforde. Rien que cela aurait pu parler en faveur du roman mais comment vous décrire ce sentiment de gêne qui ne m'a pas quittée pendant toute la lecture? Le bonheur trop heureux, l'extravagance trop extravagante, la folie trop folle, la joie trop joyeuse? La mièvrerie trop mièvre Quand c'est le narrateur qui écrit, c'est du Petit Nicolas. Quand c'est son père (extraits de son roman), c'est vianesque par certains côtés. Et j'ai même trouvé quelques passages qui permettraient de le relier à Jasper Fforde. Rien que cela aurait pu parler en faveur du roman mais comment vous décrire ce sentiment de gêne qui ne m'a pas quittée pendant toute la lecture? Le bonheur trop heureux, l'extravagance trop extravagante, la folie trop folle, la joie trop joyeuse? La mièvrerie trop mièvre aussi, au fond. Et les jeux de mots... non, ils ne sont pas pourris, c'est pire, ils sont juste nuls mais ont l'air de faire le bonheur (trop heureux) de tout le monde. J'ai beau être une étrangère, cela me met mal à l'aise. Ma petite note peut paraître méchante mais bon, je fais partie de la minorité et puis, Olivier Bourdeaut a eu son prix et en plus, il est beau gosse et Didier van Cauwelaert commence à vieillir, je ne m'inquiète donc pas pour l'avenir de l'auteur débutant. Kitabın adından tanıdık bir yazara ve meşhur bir tiyatro eserine gönderim var mı sorusu varsa aklınızda doğru bildiniz. Samuel Becket'in Godot'yu Beklerken'e dolaylı olarak bir gönderim söz konusu. Müzikal olaraksa, Nina Simon'ın Mr. Bojangles'e gönderimi de çabası. Kitap bir erkek çocuğun gözünden anlatılıyor. Aşırı mutlu yaşamına eşlik eden anne ve babasının müthiş aşkı. Annesinin birgün aniden bu aşırılığın da aşırılığına çıkması hikayenin boyutunu değiştiriyor. Bourdeaut, "Bojangles'i Beklerk Kitabın adından tanıdık bir yazara ve meşhur bir tiyatro eserine gönderim var mı sorusu varsa aklınızda doğru bildiniz. Samuel Becket'in Godot'yu Beklerken'e dolaylı olarak bir gönderim söz konusu. Müzikal olaraksa, Nina Simon'ın Mr. Bojangles'e gönderimi de çabası. Bourdeaut, "Bojangles'i Beklerken", Fransa toplumuna dair üstü kapalı gönderimlerde bulunduğunu ve Fransızların aşırılıklarına, özellikle aile kavramı üstünden giderek okuru etik arayışlar içine sokmaya çalışmış. Yazarın, aşırılığı abartma isteğinin anlatım bağlamında değerlendirdiğim de , benzer yaklaşımı kullanan birçok yazarın olmasının, bu eserin benim açımdan sıkıcı ve çok fazla tanıdık olmasına neden oluyor. Ek olarak, çocuk gözünden bir anlatımın benimsenilmesini de ciddi anlamda popülist buluyorum. Bourdeaut'ün bu eseri her ne kadar Avrupa'da 80.000 kopya bastı ve yeni bir dahi yazar doğuyor diye edebiyat dünyasına sunulsa da bu eserin bir dahilik örneği sunduğunu düşünmüyorum. Fikren beğenmiş olsam da eseri bütün olarak değerlendirdiğimde yetersiz buldum. Een mooi sprookje met een heel scherp kantje. Verse is difficult if not impossible to properly translate from one language to another. This is a story written in verse. The author plays with words. There is humor, but for the most part I found it sad, depressing and too absurd. I have no complaint with the narration of the audiobook by Gibson Frazier. O carte pe parcursul căreia am râs în hohote, dar pe care am finalizat-o lăcrimând..
Labai daug visko šitoje knygoje. Ką norėsite rasti joje, tą ir rasite, nes grožis ir siaubas, juokas ir ašaros, "sveika ir normalu" ir "beprotybė" - šalia. Aš radau visko po truputį ir man labai patiko. Me ha gustado muchísimo. Es una historia deliciosa, extravagante y bien contada. La locura y el amor extremo me han emocionado hasta las lágrimas. De vertaalster heeft hiermee trouwens ook knap werk geleverd. Un choix narratif très original, pour parler pourtant d’un sujet douloureux, celui des maladies mentales. Un beau roman qui porte en lui tout l’amour d’une famille et toute la folie d’une mère qui vit dans son monde à elle, un peu différent du nôtre. Una de las historias de amor más disparatas que he tenido la oportunidad de leer. Una forma de disfrutar la vida que desafía lo convencional. Y un final que te rompe el corazón mientras dibuja una sonrisa en tu rostro. Příběh jedné výjimečné rodiny viděný na přeskáčku očima malého syna a otce. Z chlapcova pohledu pohádkový příběh, z otcova je nejdříve také bláznivý, ale postupně vstupují do děje i černé podtóny, aby nakonec text ovládly a chlapec byl nucen dospět. První třetinu knihy jsem se stále bezděčně usmívala, střední část byla pro mě asi nejslabší, ale od okamžiku "únosu" je to zase jízda, byť tentokrát s trpkou příchutí. A i když je to ve finále vlastně velmi smutná kniha, tak je to jako s tím pohřbem Příběh jedné výjimečné rodiny viděný na přeskáčku očima malého syna a otce. Z chlapcova pohledu pohádkový příběh, z otcova je nejdříve také bláznivý, ale postupně vstupují do děje i černé podtóny, aby nakonec text ovládly a chlapec byl nucen dospět. První třetinu knihy jsem se stále bezděčně usmívala, střední část byla pro mě asi nejslabší, ale od okamžiku "únosu" je to zase jízda, byť tentokrát s trpkou příchutí. A i když je to ve finále vlastně velmi smutná kniha, tak je to jako s tím pohřbem v knize - nakonec se stejně všichni smějí. Příběh dvou lidí, kteří si chtějí žít po svém navzdory všemu a všem, a kteří jsou tak posedlí sami sebou, že neberou ohled na nikoho a nic. Příběh lásky ad absurdum. Z jednoho úhlu pohledu naprosto nepochopitelné, z druhého ale fascinující a uhrančivé. Krásná hořko-sladká knížka, po které v člověku zůstane smutek, ale i tak se při každé vzpomínce na ní musí usmívat. Snad se knížka dočká českého překladu (a doufejme, že kvalitního, protože její jazyk je jedno z jejích kouzel). První věta: "Mon pére m'avait dit qu'avant ma naissance, son métier c'étais de chasser les mouches avec un harpon." Bu kitabı okurken Nina Simone'dan ,Mr. Bojangles'i (altta linkte) arada bir dinlemekte fayda var. Tahmin edileceği gibi Bojangles'e göndermelere çok rastlayoruz. Cidden kitabın ruhu şarkıya çok uygun. Aynen şarkı gibi, eğlenceli olduğu kadar duygusal da. .
Baba muhteşem bir palavracı , anne de deliliğin uçlarında gezinen bir kadın. Bir de, gezileri esnasında sahiplendikleri ve artık evin bir bireyi olan Madam Fuzili (Telli Turna) var. İşte bu anarşist diye Bu kitabı okurken Nina Simone'dan ,Mr. Bojangles'i (altta linkte) arada bir dinlemekte fayda var. Tahmin edileceği gibi Bojangles'e göndermelere çok rastlayoruz. Cidden kitabın ruhu şarkıya çok uygun. Aynen şarkı gibi, eğlenceli olduğu kadar duygusal da. .
Terminei a leitura de "À Espera de Bojangles" agora mesmo, sentada num banco de jardim num dia fantástico com sol quentinho. E estou arrepiada! Foi este o efeito que este livro teve em mim. Deixou-me inquieta, com um nó na garganta que sei que vai levar tempo a passar. A escrita de Olivier Bourdeaut é subtil mas intensa. É descontraída mas profunda. E transformou uma história de vida de uma pequena família num livro belíssimo! priekš manis šī grāmata noteikti bija atgādinājums, ka vajag dzīvot un darīt to skaisti, elpojot ar pilnu krūti. šeit un tagad. jo viss cits jau tāpat nāks, notiks un būs, bieži vien pat nespējot to kontrolēt. un nevajag. galvenais ir spēt baudīt to mirkli, kurš dots! Pagal šią knygą galima kurti filmą, kuris pradžioje atrodytų kaip tikra romantinė komedija, o pasibaigtų krūva ašarų ir nosinių. Įtaigiai aprašyta, kaip beprotybė atrodo vaiko akimis. І кумедна, і сумна книжечка про божевілля. Син і батько почергово розповідають нам про свою маму і дружину, і гостро відчувається, що вони люблять її до нестями, хоча, як на мене, не кожен міг би жити з такою людиною, але цим двом нібито комфортно, і з нею точно не занудьгуєш, з цим не посперечаєшся. Але де межа між милими дивацтвами і хворобою? Коли мама голою виходить до крамнички купити устриць? Чи коли за вечерею кидає щойно зняті труси в обличчя знайомому? Чи коли влаштовує пожежу у вітальні? Ві І кумедна, і сумна книжечка про божевілля. Від початку було зрозуміло, що ні до чого хорошого це не приведе. Durant dix ans il travailla dans l’immobilier allant de fiascos en échecs avec un enthousiasme constant. Puis, pendant deux Olivier Bourdeaut est né au bord de l’Océan Atlantique en 1980. L’Education Nationale, refusant de comprendre ce qu’il voulait apprendre, lui rendit très vite sa liberté. Dès lors, grâce à l’absence lumineuse de télévision chez lui, il put lire beaucoup et rêvasser énormément.